Bartholomeus Klip Farmhouse is an exclusive Winelands country lodge situated on a large farm and nature reserve just over an hour's drive from Cape Town. At Bartholomeus Klip you stay in a restored Victorian farmhouse, situated just over an hour's drive from Cape Town. This Cape Winelands country lodge is located on a large farm in the Western Cape. Surrounded by the Cape Winelands, Bartholomeus Klip Farm House offers guests game drives through a beautiful fynbos nature reserve, mountain biking and comfortable accommodation. 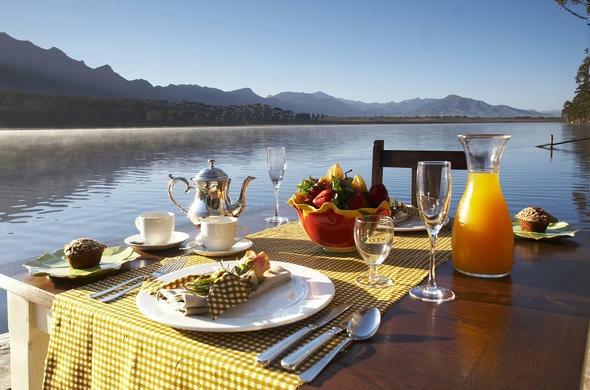 Bartholomeus Klip is a unique Cape Winelands country hotel, providing guests with privacy and exclusivity. It's an original homestead on a large private estate, which is both a working wheat and sheep farm and a nature reserve with a spectacular mountain backdrop. The rooms all feature beautiful interiors and en-suite bathrooms. Bartholomeus Klip's 10 000 acre fynbos nature reserve is part of the Cape Floral Kingdom, the world's smallest but the richest in species for its size. During game drives you can search for African wildlife including Zebra, Eland, Wildebeest, Bontebok, Springbok and Hartebeest. Bartholomeus Klip's afternoon game drives end with sundowners in the veld (open fields). The animals are easy to spot in the low-growing fynbos, especially since there are more than 500 head of game. More than 160 species of birds have been identified at Bartholomeus Klip, among them the endangered Blue Crane and the African Fish Eagle as well as the Ostrich are frequently seen in the reserve. The Deckhouse is the ideal venue for conferences and weddings. Day and overnight conference packages are available. The packages are based on small groups allowing them exclusive use of the facilities. There is an air-conditioned conference room and an upstairs breakaway room. An outside boma (outdoor enclosure) is also available. Bartholomeus Klip's chef bakes fresh bread, scones, cakes and pastries every day, while milk, cream and butter come from the dairy and lavish bouquets of herbs from the garden. Tea is a serious affair, enjoy scones with thick farm cream and home-made preserves, pecan meringues, apple tarts, prune and ricotta cheesecake, savoury bruschettas - the selection changes daily.